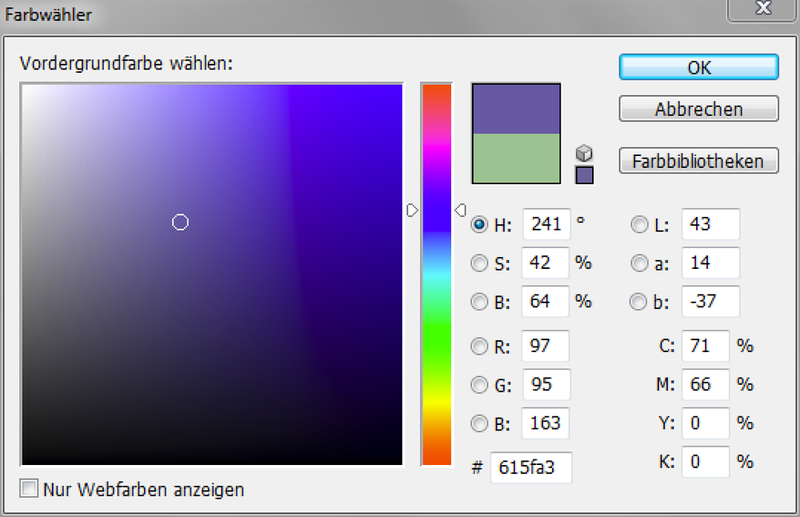 For a more perceptive color selection – freieFarbe e.V. Computer software generally provides limited options for color selection. Visual color selectors (ie color fields and color bars with regulators which represent cuts by Farbraume, see Fig. 1) may function halfway, but if the fine adjustment of individual close-by color nuances is too inaccurate. For small, precise steps, one works most numerically on the computer. Here the standard programs of most programs are limited to a selection of the following systems: RGB (Red, Green, Blue), CMYK (Cyan, Magenta, Yellow, Key) and LAB (Lightness, a, b) and HSB (Hue, Saturation , Brightness). Alternatively, there are known palettes for preselected shades (Pantone, HKS, etc.). The RGB and CMYK systems are device-specific systems. RGB refers to a mixture of colored light (e.g., monitors), and CMYK refers to a mixture by four-color printing (e.g., offset printing). They have a clear need for these technologies. However, they are rather impractical for a proper color selection. They do not correspond to an easily conceivable cognitive model of a color space. Or who could think without much, to say, which RGB values ​​give a “neutral” yellow? Since the RGB system is an additive system of light mixing, the idea is particularly difficult, since our thinking is strongly influenced by the subtractive pigment mixture. But also the mixing of printing inks has its faults: from which CMYK proportions is mixed purple (= bright violet)? The LAB system (CIELAB) is a device-independent color space. One of the advantages of the LAB color space is its four poles (instead of three basic colors). It is much more of our perception to speak of a green tending to green or red, than of a blue tending yellow. Also, we can imagine a blue-green (turquoise) better than a blue yellow (according to Ewald Hering, there are the four psychological primal colors yellow, green, blue and red). This system is very useful as a color space, but the parameters or coordinates a and b are very unintelligible. The poles of the X axis are red and green, the poles of the Y axis are blue and yellow. A corresponds to the x-axis value and B to the y-axis value. The brightness (L) changes on the Z axis. The idea of ​​colorful (or saturated) colors in the form of a color circle is much more vivid. The hue is thus given in the form of an angle. This corresponds to 0 ° red, 90 ° yellow, 180 ° green and 270 ° blue. For the less colorful, thus grayed colors, the parameter of “coloring” is significant. The grayer the less colorful. The brightness is the third parameter to define a color. Each colored color has exactly its own brightness, yellow is quite bright and violet is quite dark. However, the larger the uncoloured, ie gray, part of a color, the more the hue can vary in its brightness because gray can move between black and white. A hue with the bluntness zero is completely gray. Here, the possible brightness difference is greatest (from white to black). A definition of color over the three chromaticity, chromaticity and brightness characteristics corresponds to the generally accepted state of the art as used in the leading color systems RAL Design, NCS and Munsell. For this comprehensible and easily conceivable cognitive model for describing a color impression, the LAB color space is measured differently, or polar coordinates are used instead of Cartesian coordinates. The color model described here with its parameters Hue, Croma and Lightness has unfortunately not been abbreviated as either LCh, LCH or HLC. I prefer the order HLC (hue, brightness, saturation), since I think it is useful to start with the hue. In many computer programs, there is one similar color description with the HSB (Hue, Saturation, Brightness) parameters, as described above. However, this is only another description of the RGB color model. Just as the LAB color space can also be described as HLC coordinates, the RGB color model can also be mapped with the parameters HSB. In contrast to the LAB color space, the perceived brightness changes in this model with the same Brightness value of different colors (in LAB, the perceived brightness of different colors with the same L value is approximately the same, see Fig. 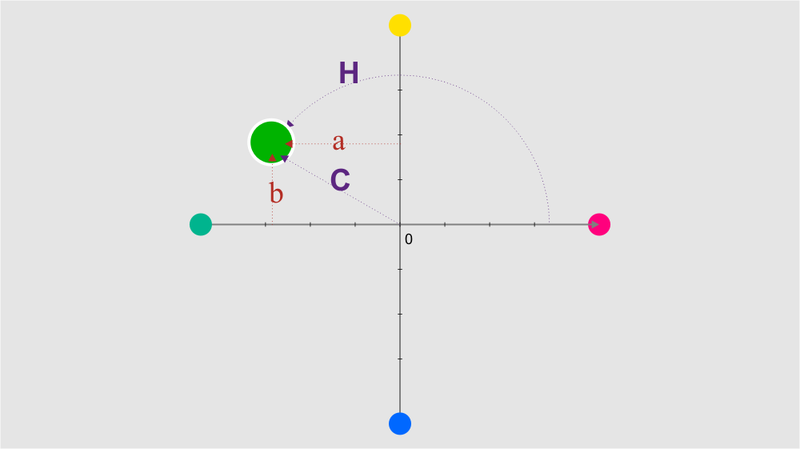 The HSB model does not correspond to Ewald Hering’s “four primary colors”, but has the three initial colors red (0 °) green (120 °) and blue (240 °). 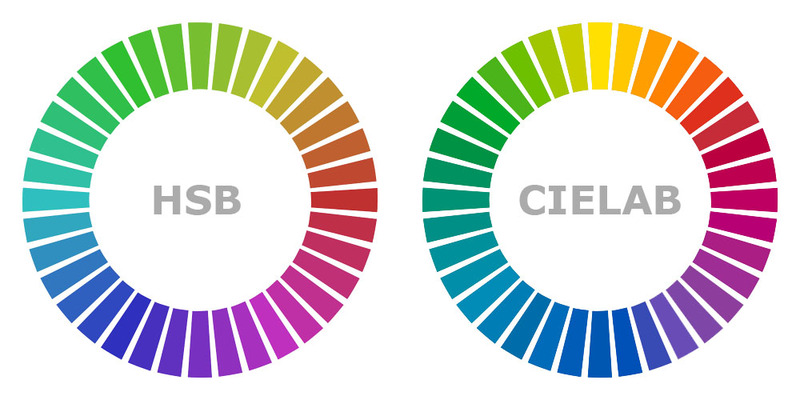 Comparison between the color circles of the RGB and CIELAB color models (HSB and HLC). The CIELAB / HLC color circle is more attractive, because CIELAB is designed in the same way as RGB. Unfortunately, the option to enter color as HLC coordinates has hardly been available until now, mostly only as a plug-in, such as CSColors! Or easy.Filter ColorConverter 1.2. A direct implementation in “quasi-standard programs”, such as the Adobe Creative Suite, would be highly desirable. A major and significant shortcoming of all providers of HLC color selectors known to me is, however, the lack of a logically necessary limitation of the parameter values ​​of L (lightness / brightness) as a function of C (chroma / chromaticity). So far, no HLC color selection interface is limited to the limits of the LAB color space. (Maximum chromaticity = no brightness variation, minimal chromaticity = maximum brightness variation). For this a graphic interface would be urgently needed to visualize this situation visually.